Having written the notes for many albums over the past 25 years, I’m pretty choosy these days about the projects I take on. When Dragon’s Domain, a relatively new soundtrack label, approached me about Assault on a Queen, I simply couldn’t resist. Jazz great Duke Ellington composed only four movie scores in his celebrated career, and this 1966 Paramount film was one of them. A caper film starring Frank Sinatra and Virna Lisi, it was unsuccessful at the box office and thus no “original soundtrack” album was ever released. It’s something of a Holy Grail for Ellington aficionados, and the challenge for me was to unravel its complex history. Between studio issues and Ellington’s touring schedule, the composer had only two weeks to write and record the music; it wasn’t enough, and studio composer/arrangers wound up doing the bulk of the work based on Ellington’s material. My notes explain exactly what happened, and which tracks are those of Ellington’s own band and which are the work of a studio ensemble. In any case, there’s a lot of great, swinging, Ellington-based jazz here. 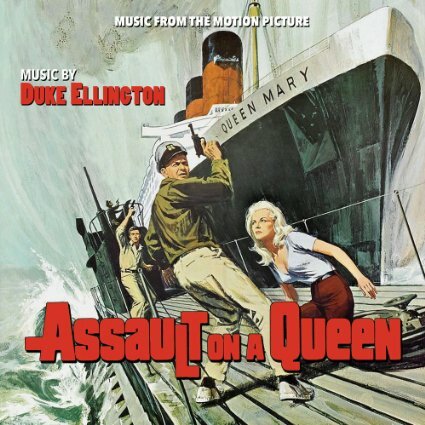 This entry was posted in Composers, Film Music and tagged Anatomy of a Murder, Assault on a Queen, BuySoundtrax.com, Dragon's Domain, Duke Ellington, Ellington film music, Frank Sinatra, Paris Blues, Virna Lisi on July 3, 2016 by Jon Burlingame.